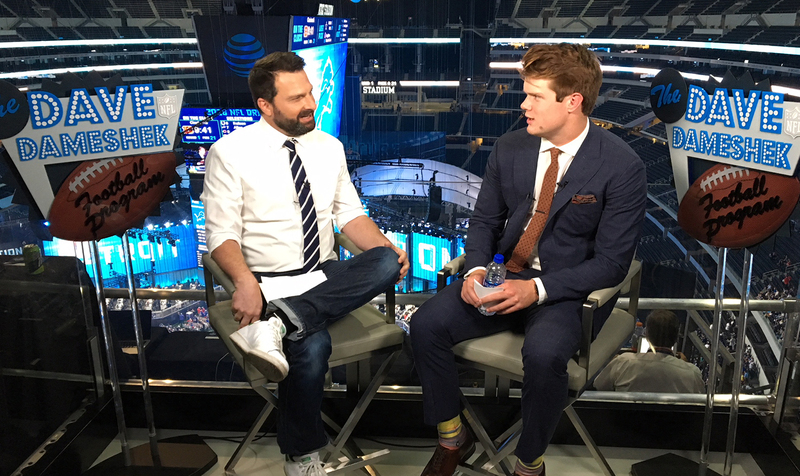 NFL Digital Media’s output from the NFL Draft has increased with each passing year, and, this year, it features a cavalcade of live-streamed coverage, social-media content, and podcasts from Arlington, TX. And, although at-home–production workflows are nothing new for NFL Media at the Draft, the Digital team is taking that approach up a notch. NFL Now Live streaming coverage is being produced by backhauling camera/audio feeds to a dedicated control room at NFL Digital Media’s broadcast center in Culver City, CA. Five Azzurro TeamCam systems in Arlington are being used to transmit the feeds. On-air talent is located in a studio in Culver City. NFL Digital Media’s coverage of the Draft is headlined by NFL Now Live, which is live-streaming every pick of the Draft, Rounds 1-7. Thursday night, NFL Now Live featured host Matt “Money” Smith and analysts Bucky Brooks and Lance Zierlein from the studio in Culver City. That format will continue tonight for Rounds 2-3 and then will be the sole outlet for viewing the real-time announcement of every pick from each team’s determined location for Rounds 4-7 on Saturday. NFL Digital Media producers Erica Tamposi (foreground, left) and Emma Sauerwein (foreground, right) capture Dave Dameshek’s (on sofa) interview with Stanford coach David Shaw (left) and NFL Network analyst Steve Mariucci on Tuesday at the Ritz-Carlton Dallas. In addition to having access to camera feeds from NFL Network, NFL Now Live has deployed a unilateral RF handheld camera for its coverage (an RF Sony F55 4K camera is also onsite, capturing cinematic-style content). In addition to NFL Now Live, NFL Media has a massive social-content plan in place for Twitter, Facebook, Instagram, and Snapchat. A Live Story on Snapchat chronicles the first-round festivities from an all-access, first-person point of view and full 360-degree behind-the-scenes NFL Draft experience. Social media was also a major focus during the Red Carpet Special prior to the Round 1 on Thursday, when #NFLBlitz live-streamed coverage on Twitter and the social-media team deployed dedicated red-carpet activations. The content was delivered to Culver City via the Azzurro TeamCam systems. The NFL Digital Media team is also producing live and on-demand podcasts (both audio and video) and VOD interviews at AT&T Stadium, including editions of Move the Sticks podcast and the Dave Dameshek Football Program. The team is deploying Canon EOS 5D cameras to shoot content and an Azzurro TeamCam system to transmit the content to Culver City. 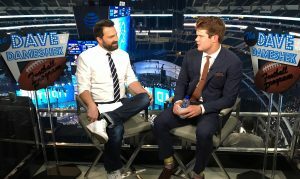 NFL podcast host Dave Dameshek (left) interviews Sam Darnold in the podcast suite at AT&T Stadium just after he was drafted by the New York Jets. 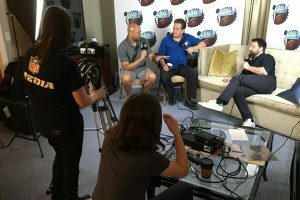 On Monday, NFL Digital Media live-streamed an NFL Draft-preview edition of the Move the Sticks podcast with Daniel Jeremiah in a suite at AT&T Stadium and co-host Bucky Brooks in Culver City. The Azzurro TeamCam system transmitted a live feed of Jeremiah to Culver and received a return feed of Brooks. Integrated at the control room in Culver City, the show was streamed to fans and then was cut up into individual VOD pieces, which were posted on NFL.com, YouTube, and the league’s social platforms. Brady and company also produced a VOD episode of the Dave Dameshek Football Program podcast from the Ritz-Carlton Dallas on Monday. On Thursday night, as has become tradition, after crossing the stage and being interviewed on NFL Network, each draftee was put through “the car wash” on the 400 level of AT&T Stadium. This series of video interviews and photo ops will be used by NFL Media across all its platforms throughout the season. Among the stops on the car wash was a one-on-one 5-minute interview with Dameshek. Both cameras from each interview were fed directly to Culver City, where a team of four editors cut up the interviews and published both audio and video clips to NFL Digital and social-media outlets. On Friday night, Dameshek and the production team will be in the green room shooting content with the NFL legends and current players announcing the picks. Once again, this content will be quickly turned around for audio purposes and VOD that will be distributed across NFL digital and social platforms. On Saturday, the final podcast of the week will be recorded with Good Morning Football’s Kay Adams, Nate Burleson, and Kyle Brandt.